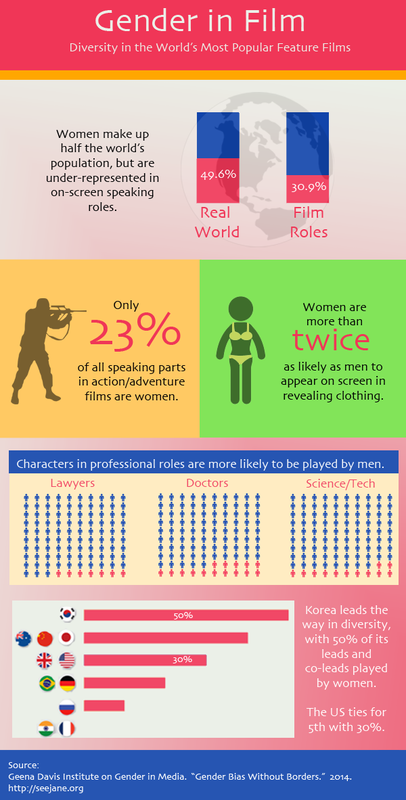 Just how big is the gender gap in Hollywood? The Hunger Games trilogy, which has grossed over $1.4 billion according to Box Office Mojo, is the poster child for the box office potential of female-driven films. Yet despite this sort of progress, the Geena Davis Institute on Gender in Media reports that gender diversity in film, overall, hasn't improved much since WWII. The Institute's "Gender Bias Without Borders" report examined the portrayal of women in the most popular films across 11 countries. For a class project, I created the following infographic from the data in that report. The findings were similar to those in another study by the Center for the Study of Women in Television and Film. Both studies were done in 2014, but there's little to suggest that the trend has significantly changed since then. With gender equality being a hot-button topic in Hollywood, I'm sure we'll start to see more studies coming out about recent films. It's worth noting that TV seems to have a better landscape than film. A different study from the Center for the Study of Women in Television and Film reports slightly less depressing numbers for the portrayal of women on TV. But before you crack open the champagne, consider that study's look at the numbers for women of color, professional women and women's ages and... well, it's just a mess. Here's hoping 2016 will be better.